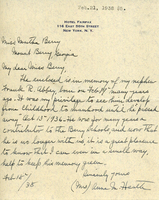 In this letter Martha Berry thanks Mrs. Heath for her donation in memory of her nephew Frank R. Abbey. 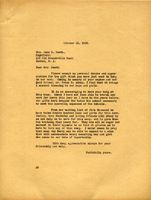 Mrs. Heath explains that she is sending a check in memory of her nephew, Frank R. Abbey, who passed away in 1936. She says that he was a contributor to the Berry Schools and that she is glad to keep his memory alive. Mrs. Schieffelin donates $2500 in memory of Louise Vanderbilt Schieffelin Hewitt.